Commonsense & Wonder: China Rocked By Two Biggest Corporate Defaults Yet...related to green energy. 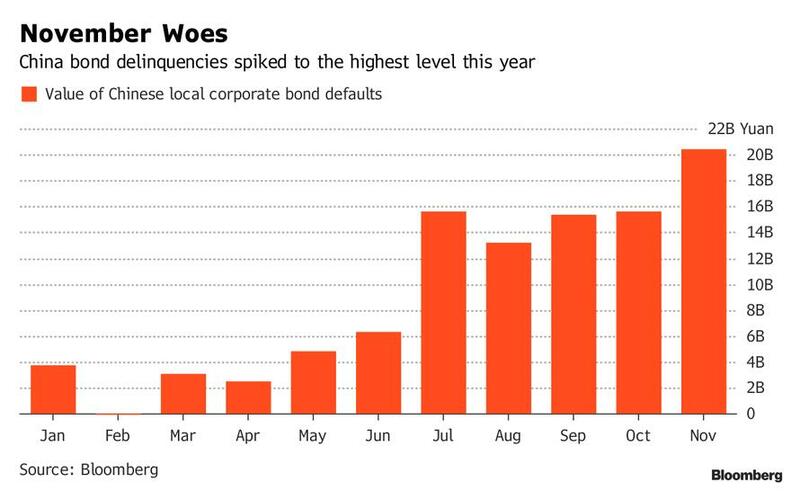 China Rocked By Two Biggest Corporate Defaults Yet...related to green energy. China Rocked By Two Biggest Corporate Defaults YetEver since Beijing allowed Chinese companies (even certain state-owned enterprises) to officially fail for the first time in 2016, and file for bankruptcy to restructure their unsustainable debt loads, it's been a one-way street of corporate bankruptcies, one which we profiled last June in "
Is It Time To Start Worrying About China's Debt Default Avalanche", and which culminated with a record number of Chinese onshore bond defaults in 2018, as a liquidity crunch sparked a record 119.6 billion yuan in defaults on local Chinese debt in 2018.Time To Start Worrying About China's Debt Default Avalanche", and which culminated with a record number of Chinese onshore bond defaults in 2018, as a liquidity crunch sparked a record 119.6 billion yuan in defaults on local Chinese debt in 2018.since Beijing allowed Chinese companies (even certain state-owned enterprises) to officially fail for the first time in 2016, and file for bankruptcy to restructure their unsustainable debt loads, it's been a one-way street of corporate bankruptcies, one which we profiled last June in "Is It Time To Start Worrying About China's Debt Default Avalanche", and which culminated with a record number of Chinese onshore bond defaults in 2018, as a liquidity crunch sparked a record 119.6 billion yuan in defaults on local Chinese debt in 2018.
since Beijing allowed Chinese companies (even certain state-owned enterprises) to officially fail for the first time in 2016, and file for bankruptcy to restructure their unsustainable debt loads, it's been a one-way street of corporate bankruptcies, one which we profiled last June in "Is It Time To Start Worrying About China's Debt Default Avalanche", and which culminated with a record number of Chinese onshore bond defaults in 2018, as a liquidity crunch sparked a record 119.6 billion yuan in defaults on local Chinese debt in 2018.